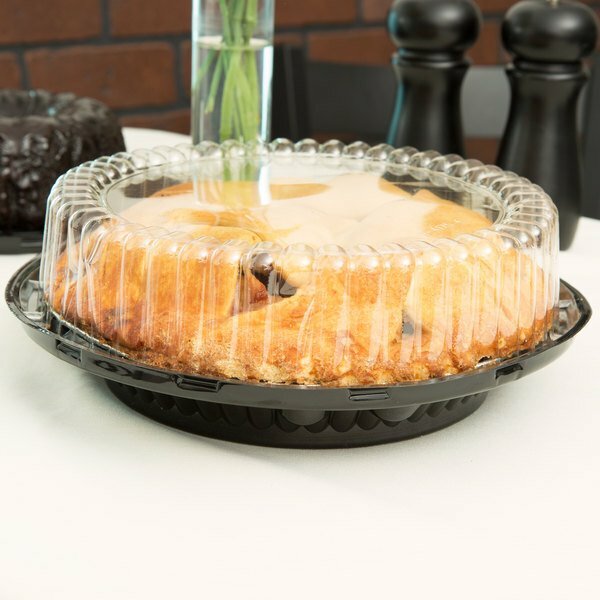 Show off your finest culinary creations and increase impulse buys with this D&W Fine Pack J43-1 9" pie display container with clear low dome lid. The container combines a durable, black polystyrene (OPS) plastic base with a clear high dome lid to provide the best possible display for your delicious, freshly-baked goods. It is also resistant to water and oxygen, and therefore does not transmit exterior food odors to the food products inside. 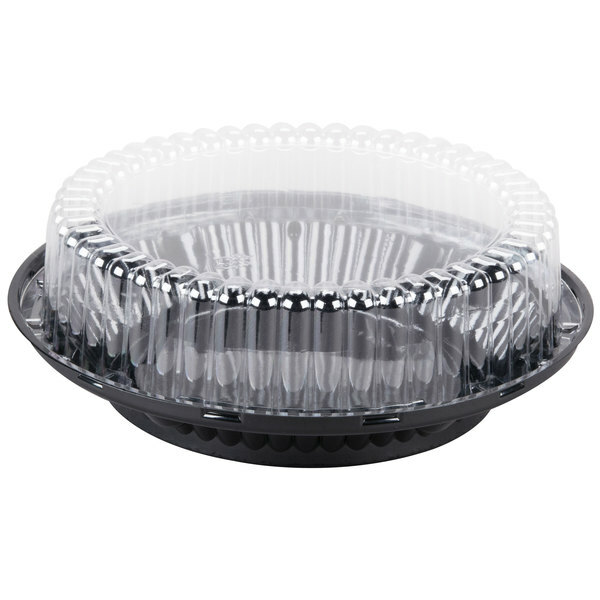 The tray will fit any disposable pie pan up to 9" in diameter. Interior Base Height: 1 3/4"
Interior Lid Height: 2 1/8"
These pie display containers are the best for transporting my pies! They hold the pie perfectly and are very sturdy! I will buy them again! We used to use the white boxes but the clear high dome containers are so much better to display our beautiful pies. It really shows off the pies for the customers! I work in a locally owned restaurant/bakery and I ordered these for whole pies to sell for the holidays. I found that you can't put just any 9" pie pan in them so make sure to check the measurements. I tried using a few store bought ones that I had left before opening the ones I ordered from here and they were too wide and not deep enough. The container worked out well for me once I used the appropriate pie pan. Tip though: make sure that your crust doesn't overlap the edge of the pan or you'll have trouble closing the lid. The high dome protects the top decorations and whipped cream from getting destroyed. Solid design that supports the pie. Only problem is that getting the lid off is a little tricky. Very secure. 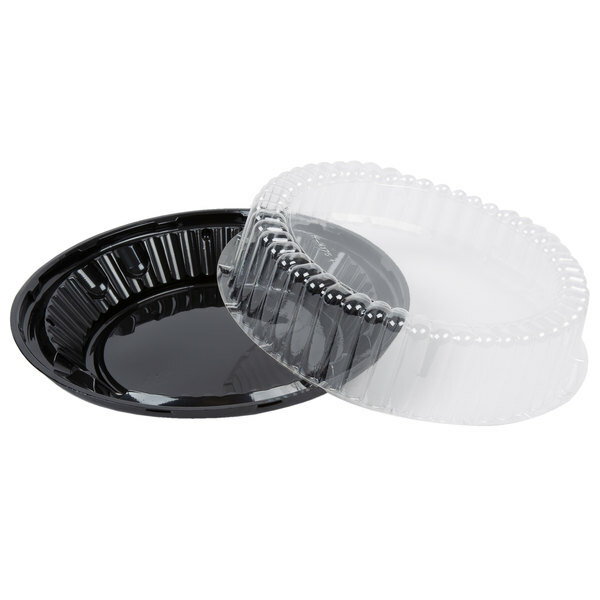 We love these disposable pie containers. It really shows off our product and looks great with labels. We send these out to wholesale clients as well. Love how the pies fit so easily in them. This pie carrier is perfect height for my meringue and love the thickness of the carrier. It's very sturdy and a quality carrier! Thanks again! I purchased the 9: pie display container for lemon meringue pies that I make for our annual craft fair and bakery that our church has every fall. I never had a way to cover them before so the meringue would not stick to seran wrap or a plastic bag. These containers work great. Love LOVE these containers. My foil pie container fit into these perfectly so that selling and packaging is seamless. Will be buying more of these. The pie display container fits my 9" pies just right. Instead of transporting pies in a plain box, this way the cake is also displayed. Wilkinson J43 9" Pie Display Container with High Dome Lid. I make a lot of pies for friends and family and often lose the pans in the process. This makes it a lot easier to send or leave behind. We bought the low dome for our 1lb cookies but needed something bigger for the 2lbs of our cookies. This works out great and is the perfect size! These are an awesome display container fit my meringue and taller pies. The lids fit tight and don't come off like some pie containers. Already ordered my 2nd batch if these!!! These pie containers are perfect for displaying our pies in our display case. 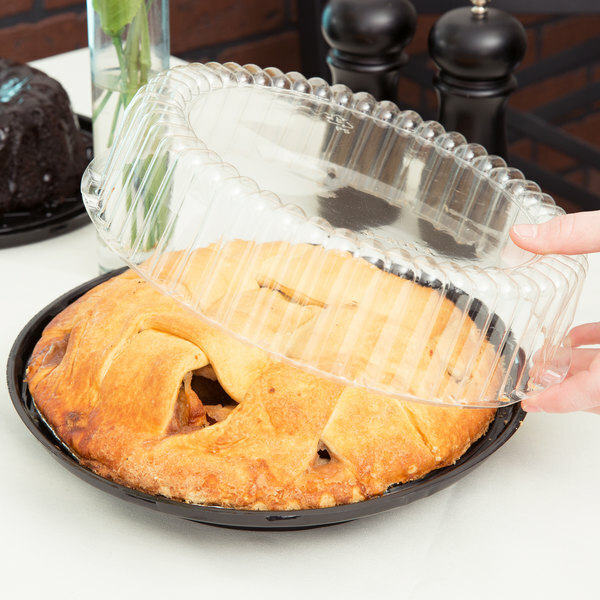 We love the high dome lid so that the packaging doesn't mess the pie up. 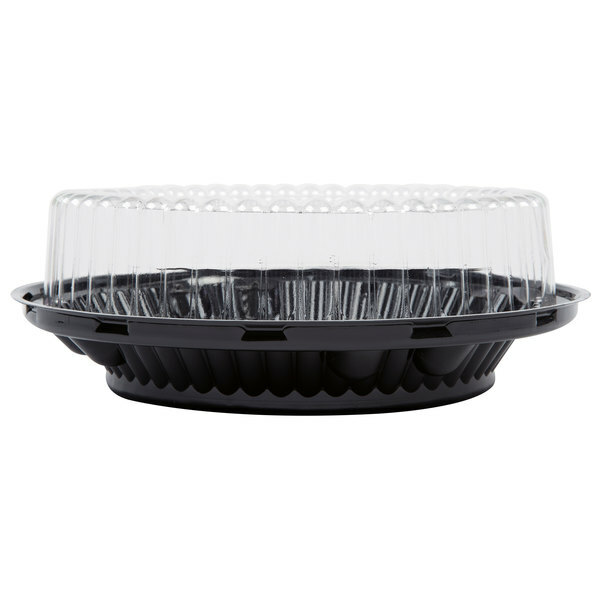 These are great high dome pie containers! I used them for all of my holiday orders! Very durable and open/close easily. Also LOVE the pack size options! Pies seem to be the stepchild when it comes to finding reusable storage. Most of the ones I found in the past are far too shallow for pies with lots of meringue or whipped cream, mostly just suitable for something like pumpkin or pecan. Then I found this container. WOW. My sky-high meringue pies are protected beautifully, showcased as though they came from a high-end bakery. They can be stacked (think Thanksgiving) and I have been known to bring them home (if not used for a gift) to wash and reuse. They are very stury, very classy looking. Makes your pie look like a million bucks. This 9" pie containers are sturdy and serve more than one purpose for me. My pie tins fit snuggly inside without moving around. I also use these containers, inverted, to store and display the party mixes that I make for customers. The lid serves as a nice large "bowl" and the lid snaps securely shut. A wonderful container to display my pies! It is durable and attractive! Works beautifully with the 9" deep dish pie pan. Very happy with this product! I love these containers. My pies fit in it perfectly and they do not shift or move around. This is the place for all your baking and transporting needs. Won't go anywhere else. Great price also!